The holiday baking season is upon us and since you can never have too many holiday cookie recipes I have joined up with 12 other bloggers to bring you The Ultimate Baker’s Dozen Christmas Cookie Exchange. In addition to bringing you great holiday cookie ideas, 7 of the participating bloggers will be giving away cookie of the month club memberships! To see all of the participating bloggers, and to learn more about the cookie giveaways, please visit the Baker’s Dozen home site at www.13CookieChristmas.info . 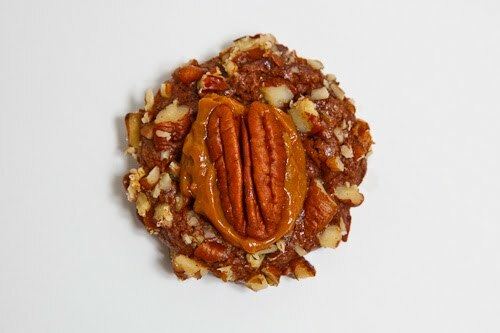 When I came across the concept of chocolate turtle cookies on Baking and Boys I immediatly bookmarked the page and filed it away for next year. Now that the holidays are finally here it was time to make some chocolate turtle cookies! 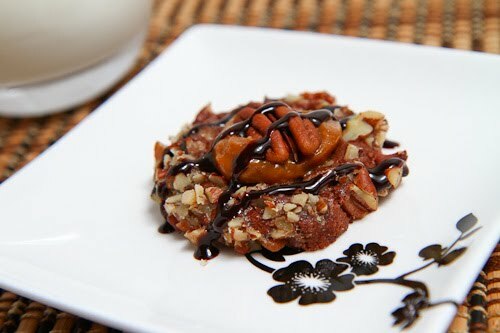 These chocolate turtle cookies are essentially a chocolate thumbprint cookie that is covered with chopped pecan pieces and filled with caramel and then topped with a pecan. (Katrina even drizzled hers in chocolate for even more chocolaty goodness!) The recipe as pretty easy to follow with the only thing out of the ordinary being some chilling time in the fridge for the dough before baking. I always seem to have this problem when making cookies where the recipe says that it will make 24 cookies and I only end up with about 12 cookies. I guess I just like my cookies large. Most of the recipes that I found called for melting the soft caramel candies for the caramel filling but since I had just made some dulce de leche I went with that instead. The chocolate turtle cookies turned out really well! 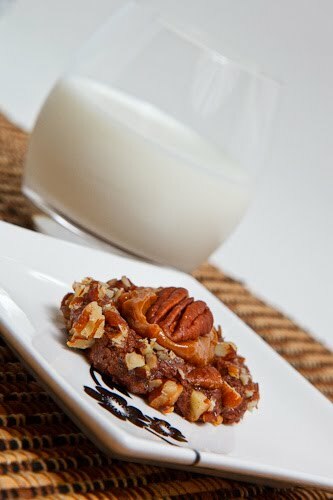 The cookie was a nice and light and cakey and it went really well with the pecans and dulce de leche. I will definitely be making these for years to come! I am now a dozen chocolate turtles in the lead! I will have to get the next batch into the oven as soon as possible to widen the gap! 🙂 Unfortunately I don’t think many will survive long enough to make it under the tree as they are disappearing rather quickly. They are like and endangered species. Mix the flour, cocoa and salt in a bowl. Beet the butter and sugar until fluffy. Beat in the egg yolk, milk and vanilla. Form the dough into 1 inch balls. Dip the balls in the egg white and then in the pecans. Place the balls on a parchment lined baking sheet with the pecans face up. Indent the center of the balls with a teaspoon. Bake in a preheated 350F/180C oven until set, about 10-12 minutes rotating the baking pan in the middle. 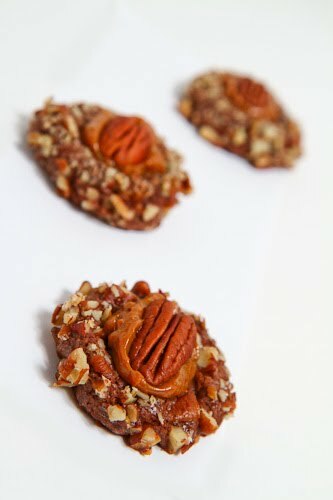 Fill each cookie with a teaspoon of dulce de leche and top with a pecan. To see all of the participating bloggers, and to learn more about the cookie giveaways, please visit the Baker’s Dozen home site at www.13CookieChristmas.info. Kevin, these cookies look amazing!!! Your cookies look delicious! Perfect for this time of year. What can I say? Yum-just yum , yum and yum! Yum! what a wonderful looking cookie! Kevin, this is a treat indeed! Chocolate, caramel, pecans all in one delectable bite. YUM! The cookie exchange site is terrific, as well. Thanks for the link. Ahh, thanks for reminding me of these! And thanks for the shout out! I made caramel by boiling the condensed milk in a can last year when I made those–SOOO good and fun to try! Your cookies look de-lish and makes me want to make them again–and tonight I have a cookie exchange and haven't decided what to make yet! Hmmm? Kevin I'm so strapped on what to give this year for foodie gifts! I must just give these a go. Wonderful! These cookies are INSANE!! Holy smokes! TFS!! I will never tire of the chocolate/caramel combination. These look amazing! These look great!! I would have to take out the pecans (so would it be a headless turtle? haha), but I would still want to make this. YUM! 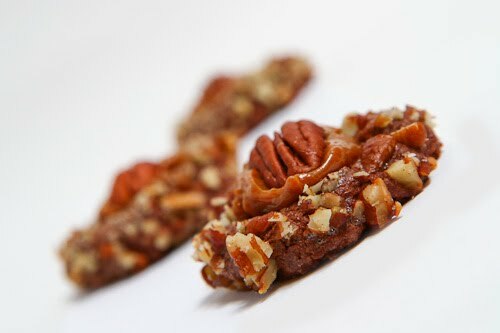 Turtles are my favorite chocolates and I love anything with Pecans. oh Kevin your killing me, these look great! I'm now planning to make some for our christmas, as the ones that usually get given, are rather terrible, but hubby just can't make himself tell his 98yr old aunt that. This year they can eat good turtles and 'save' the boxed ones. Oooh la la. It's a two bite of perfection. The dulce de leche part looks great. Great idea! And the cookies are just gorgeous. These look so delicious!!!! Great job on one of my fav cookies ever! how lovely! love the way you dec'd the plate! These are just my kind of cookies: pretty, turtles, and not pretentious. Thank you for the recipe! Good choice Kevin! They wouldn't last a minute here. Kevin the photos alone make me want to eat the screen version. They are now definitely on my must make soon list. Thanks for sharing. These look like a perfect addition to the holiday list. Thank you! Drooling over this one. I bookmarked it. So I left a comment a couple of days ago saying I needed to make these. Well, I did and I am soooo glad about it! They are ammmazing! I used cajeta instead of the dulce de leche which was a bit runny but still unbelievable tasty. Thanks Kevin! These look amazing and so easy! I think I gained a pound just by reading this post. I hope no one ever lets me make these or I'll never fit into my skinny jeans again. Hi! I have only just stumbled upon your blog and I subscribed immediately! You are creative and a great foodie photographer! I made the Chocolate Turtle Cookies for my office Cookie Exchange and had to keep bragging about finding your blog. Thank you!!! Kevin, this recipe is dangerous…love turtles and I could eat a whole box! My mom would love these! I'll have to save the recipe. These cookies are absolutely delicous — very rich and chocolately!! The dulce del leche is the perfect caramel sauce (my first time making this.) Our smaller sized cookies turned out great and look wonderful on a Christmas plate. Got 52 from a double batch and will definitely make more soon! I sprinkled a bit of coarse sea salt- ah! To die for! Delish! I love that sweet & salty sensation!